Our Economy is almost $20 trillion a year. If just 30% of this was American Made, we could have 100% employment. That is why 1 day a month is almost enough to make all the difference. That’s 2 weeks a year. Hawaii has one added bonus: Tourism. ASP gathers that if just 7% joined in, that’s $8 billion a year. The local economy will boom. That means throwing a party every tourist wants to join. ASP is looking for 200,000 friends to join our Hawaii launch for this 1st Saturday party. It will build the local communities, create great jobs across the country and jump start America. It’s 4th of July meets American Idol of Entrepreneurs - every month. ASP packaged this as a political party to tap all the pent-up frustration into a simple, fun and effective action step. Every dollar is a vote. 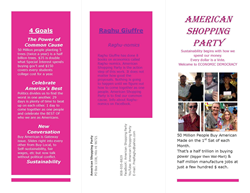 The American Shopping Party is developed by Raghu-nomics, the economic series of 8 books by Raghu Giuffre. ASP will be announcing other supporting vendors, shoppers and groups shortly. 4. This comes to one manufacturing job per $100k. This maybe used as a rough estimate given that the figure changes according to industry and product line. The primary point is that manufacturing jobs provide better wages and benefits then most retail and other low end paying jobs and so each manufacturing job generally has corresponding support jobs like coffee shops, supermarkets, auto shops etc. As such, each manufacturing job can represent several additional jobs as well. 6. Raghu-nomics is building upon the concept and power of a new brand of democracy: Economic Democracy. Buying American Made products on this 1st Sat is but only the beginning. 9. The USA Economy is so big that we can have 100% employment if just a fraction of our consumption was of American Made products. This is not true of any other country.